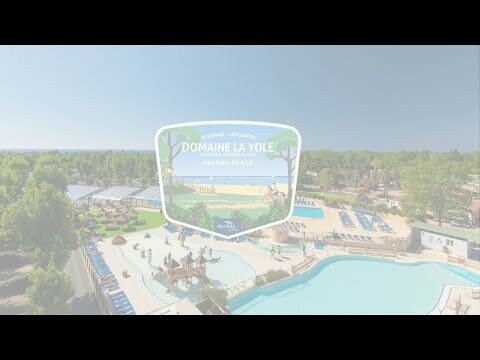 At Domaine La Yole we have our heart set on satisfying your needs to ensure a delightful holiday: Aqua park, playgrounds, sports ground, restaurants, bars, games and activities.Winery where all the wines produced on our huge vineyard (110 hectares) can be tasted. Farm with restaurant. And right here, we can suggest you this bright and peaceful cottage... which is so typically Mediterranean (30 m2- for 5 people maximum), nestled under pine trees. Dip your feet in water and make the most of your rental either with your family or a group of friends. 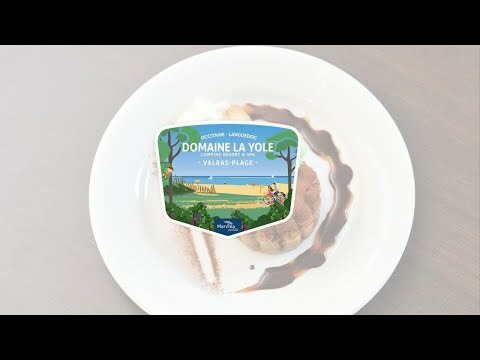 Enjoy the Hérault region’s incredible atmosphere. You're surrounded by such stunning scenery! The beach, the seafront, the swimming pool and the water park are all waiting for you. Long live our 5-star campsite! Pavilion - approximately 30 m², air conditionning. 2 bedrooms / 5 persons maximum (2 adults + 3 children) 1 room with double bed (width 140 cm) 1 children’s room with bunk beds (width 80 cm) and 1 children's high sleeper bed (width 65 cm) (Third bed in children's room not appropriate for people over 40kg.) Fully equipped kitchen with fridge, microwave oven, electric hobs and crockery for 5 people. Bathroom with WC. Safe Garden with terrace, umbrella, garden furniture, 2 sun loungers Pillows and blankets provided. This lodge tent, built with a robust wooden structure, offers an ideal setting for families or groups of friends who want to feel the thrills of adventure, but without sacrificing comfort! The mobilehome’s interior design, with puts forward natural materials, is reminiscent of luxury. Just have a look at the kitchen! Equipped tent - approximately 35 m², air conditionning. 2 bedrooms / 5 persons maximum 1 room with 1 double bed (width 160 cm) 1 room with bunk beds and 1 single bed (width 80 cm) Dining area, fully equipped kitchen with tabletop fridge, microwave oven, gas hobs and crockery for 5 people. Bathroom with WC. Safe Covered terrace - Picnic table with benches - 2 sun loungers Pillows and blankets provided. Choose this 24 m2 mobilehome which is the ideal accommodation for 2 to 4 persons. Concentrate on what’s essential : comfort, simplicity and practicality! After all, how will you be spending the rest of your day? Strolling on the beach and relaxing by the pool, right? Mobile home - approximately 18 m², air conditionning. 2 bedrooms / 4 persons maximum 1 room with double bed (width 140 cm) 1 room with twin beds (width 70 cm or 80 cm) Living room with dining area Fully equipped kitchen with fridge, gas hobs, microwave oven, and crockery for 4 people. bathroom with WC. Safe Garden table with 4 chairs, 2 sun loungers Garden with terrace covered by a shade sail. Pillows and blankets provided. Whether you intend to come with your family or with a group of friends, think big with this air-conditioned mobilehome. It displays cutting-edge design on the inside, while looking totally neutral and insignificant from the outside. Everyone can truly relax here, each of you being able to do whatever you like: sunbathing at the beach, lazy magazine flickering on a sun lounger by the pool, or splashing around at the campsite's water park. A true 5-star holiday for all! Mobile home - approximately 32 m² 3 bedrooms / 6 persons maximum Air conditioning 1 room with double bed (width 140 cm or 160 cm) 1 room with twin beds (width 70 cm or 80 cm) 1 children’s bedroom with bunk beds or twin beds (width 70 cm or 80 cm) Dining area, fully equipped kitchen with fridge, microwave oven, gas hobs and crockery for 6 people. Bathroom and separate WC. Safe Garden with a wooden terrace covered by a shade sail. Garden furniture, 2 sun loungers Pillows and blankets provided. Imagine a comfortable mobilehome, a few steps away from the beach, for your Mediterranean holiday. Bring your little ones along (or not!)... and settle down for the night in this bright, modern love nest! Make your life easier by staying in a calm and bright mobilehome. The Hérault region is particularly adapted to this kind of holiday! Mobile home - approximately 20 m², air conditionning. 1 bedroom / 2 persons maximum (bedwidth 160cm) + 1 baby (under 2 years) (baby cot not provided) Living room with dining area, fully equipped kitchen with tabletop fridge, microwave oven, gas or electric hobs, microwave oven and crockery for 2 people. Bathroom and separate WC. Safe Garden furniture, 2 deck chairs Wooden Terrace covered by a shade sail. Pillows and blankets provided. Each pitch is bordered by natural hedges for privacy. Three connections are provided, guaranteeing access to clean water, electricity (5 Amps-1200W – French and European sockets) and sewage disposal. There is a separate and private parking space for your vehicle. Pitch for 1 basic installation (1 caravan or 1 tent or 1 motorhome, + 1 awning + 1 tent - 2m²), 1 vehicle and maximum 6 people (children and babies included) 3 connections provided : drinking water, electricity (5 A -1200W – French and European sockets) and sewage. Pitch mostly planted (poplar or pine trees). Basic installation (without small tent) must not exceed 7.50m or 30m2. Mobile home approximately 33m² 2 bedrooms and 2 bathrooms / 4 people Air-conditioning 1 bedroom with 1 double bed (160x190 cm), private bathroom and a separate toilet 1 bedroom with 2 beds (80x190 cm), private bathroom and a separate toilet Multifunctional office space Dining area - Kitchen with refrigerator, microwave, gas cooker. Safe. Garden with terrace covered by a shade sail. Mobile home - approximately 40 m² 4 bedrooms / 8 persons maximum Air conditioning 1 room with double bed (width 160 cm) 2 room with twin beds (width 70 cm or 80 cm) 1 bedroom with bunk beds (width 70 cm or 80 cm) Dining area, fully equipped kitchen with fridge, microwave oven, gas hobs and crockery for 8 people. 2 Bathrooms and 2 separate WC. Safe Garden with a wooden terrace covered by a shade sail. Garden furniture, 2 sun loungers Pillows and blankets provided. Are not allowed in Carignan: Groups or grouping of several families. Het zwemparadijs wat geen paradijs was samen met de kinderachtige badmeester, aan het zwembad mocht niks behalve stil liggen.